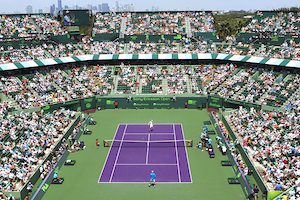 Miami-Dade County voters casting ballots this fall will have an opportunity to approve tournament-funded upgrades to the Crandon Park Tennis Center that will enhance the park for year-round public use and safeguard the Sony Open’s future in Miami. Voters will be asked to vote yes on #238, a referendum to authorize improvements to the park’s facilities and an extension of the Tournament’s usage agreement beyond the current nine year term. The park improvements would be entirely paid for by Tournament-generated revenues and cost savings, with no cost to taxpayers. Efforts to educate the public on the measure and galvanize support are being spearheaded by the Park Partnership campaign, a coalition of business and civic leaders from Miami-Dade County and beyond. Click here for more information from the official Sony Open website. The Sony Open is also looking for dedicated people to volunteer at polling stations during the early voting period, October 27 – November 3, and on November 6, Election Day. Shifts will be four hours in duration. In return for volunteering, a voucher for one ticket for the Sony Open will be issued for each four hour shift that you volunteer. Vouchers are redeemable for Wednesday, March 20th day session (session 3) or Thursday, March 21 night session (session 6).